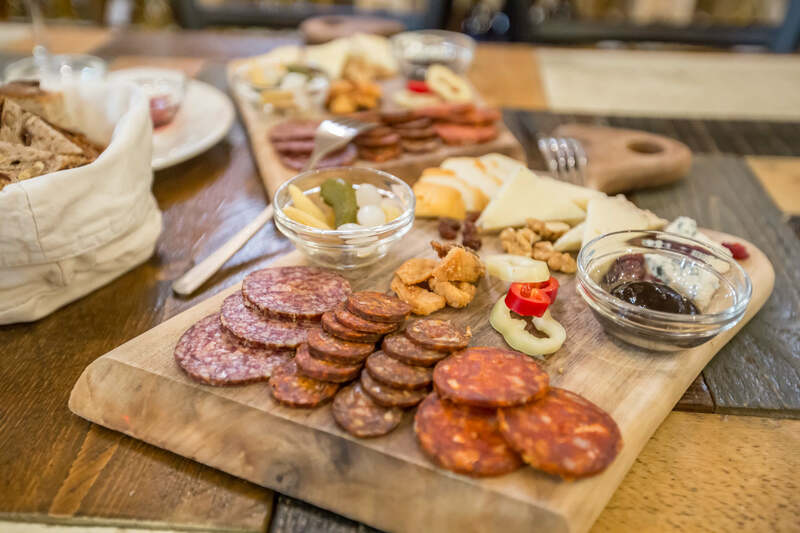 A Hungarian cold plate (“hidegtál”) is a classic way to showcase the wide variety of charcuterie which butcher shops, market stalls, and kitchen pantries are brimming with. When a cold plate is offered on restaurant menus, fancy restaurants will dress it up with slices of foie gras or smoked goose breast. At home it can be as simple as an old wooden cutting board piled with rustic sausages, home-grown vegetables, pickles, or whatever else is on hand. The components are always different, depending on who prepares it, and it can serve as anything from breakfast to a light meal or an appetizer to nibble on while the main meal is being prepared. 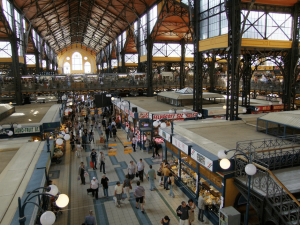 In Hungary all manner of paprika-spiked sausage, salami, bacon, head cheese and ham are made from pork. In the countryside it is common for families to hold an annual disznótor (pig slaughter) in the winter during which they spend the day stuffing sausages, preparing bacon to cure, and making lots and lots of cracklings. It was at a disznótor near Gyöngyös, a town an hour drive east of Budapest, where I saw firsthand how these pork products—which are so abundant at the markets all over Budapest—were made. That day I realized how much Hungarians value using all parts of the animal when they cook, and this is evident in the selection offered on a cold plate. Similar to an Italian antipasti plate, a hidegtál can consist of whatever happens to be in the pantry or the chef feels like adding. 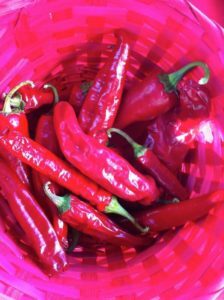 But there are certain essential ingredients, such as (1) thick slices of fresh crusty white bread; a variety of fresh, sliced vegetables such as (2) sweet Hungarian wax peppers, (3) hot peppers, and (4) tomato wedges; and several types of pork charcuterie. If cracklings (missing from this picture), which can either be made from goose or pork, are served, then adding some thinly sliced (5) red onions is essential. The best way to eat the crackling is by tearing off a piece of bread and eating scooping up a crackling and a piece of onion with it. 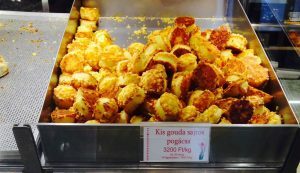 (6) Körözött (Liptauer)—a spread made from curd cheese (either sheep or cow milk), paprika and caraway seeds—is always a welcome addition, as is some local Hungarian cheese such as (7) juh sajt (sheep cheese). 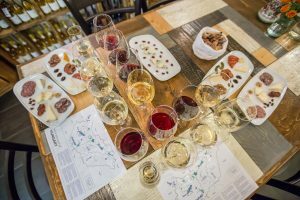 Of course, the star of any cold plate must be the charcuterie, such as (8) ham (sonka), (9) bacon (szalonna), (10) salami, and (11) dry sausage (kolbász). 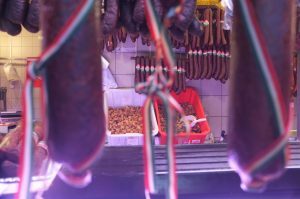 It would be rare to find a dry sausage in Hungary that wasn’t tinted orange from the addition of paprika, either sweet or hot, and usually a few different varieties are served. A richer cold plate could feature (12) smoked meat, such as duck breast, or (13) foie gras, a Hungarian specialty which is abundant here. 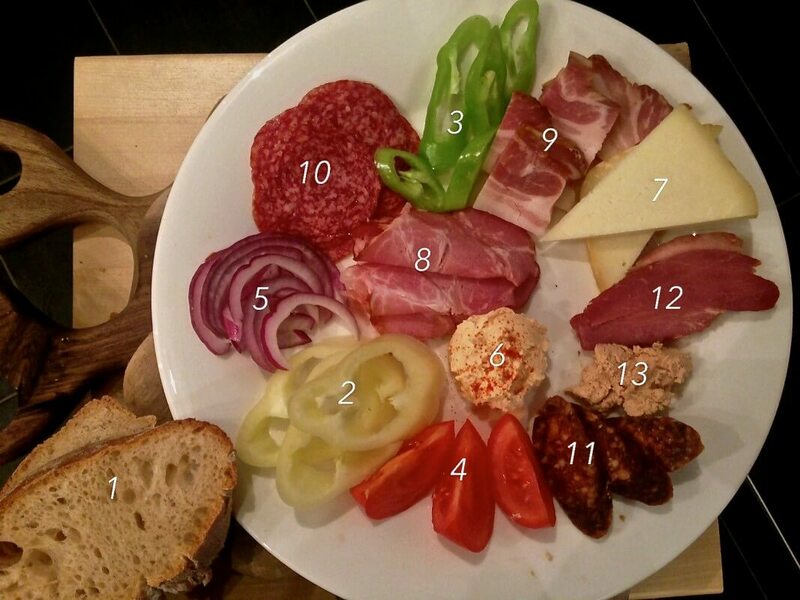 There are no rules to remember when preparing a Hungarian cold plate. But following the principle that more variety and abundance is better, will take you far in Hungarian cookery. 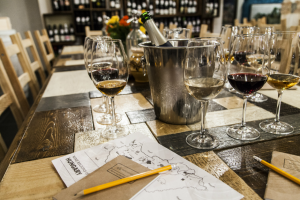 Try a variety of local cheese and charcuterie sourced from small producers at The Tasting Table Budapest (and pair it with wine at our Wine, Cheese, & Charcuterie Tasting and our Essentials of Hungarian Wine Tasting).